This image was captured Sunday, April 14, 2019, by Christy McVaugh in Chautauqua County. Tornadoes were on many people’s minds Sunday evening. Severe thunderstorms were racing into the Southern Tier and came with a history of wind damage in Ohio and several tornado warnings in northern Ohio and northwest Pennsylvania. The Storm Prediction Center had issued a tornado watch for Chautauqua, Cattaraugus, Allegany and Wyoming counties. 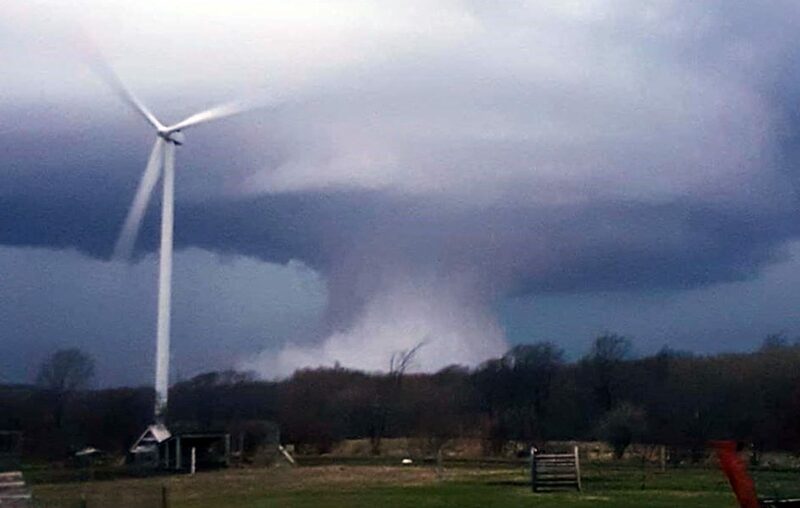 There is no evidence of tornado touchdowns in Western New York, but some of the storms made for some spectacular images, like the one above by Christy McVaugh in western Chautauqua County. The image appears to show a cold air-weighted rain shaft tumbling to the ground, with straight-line winds spreading out at the surface. It may have been a better organized microburst, which is more commonly associated with damaging straight-line winds. Click here to see the preliminary storm reports as of Monday morning from the Buffalo National Weather Service. Of all the weather phenomena being impacted by the mean global warming climate, mostly in a negative way, warming effects on tornadoes are among the most poorly understood mechanisms. Even though Western New York is by no means in a tornado hot spot, we are far from immune to tornadoes. So let’s take a look at some of what is known about climate change and tornadoes. We are confident warming oceans will supply more energy and moisture for intensification of hurricanes, but most evidence now supports intensification rather than an increase in the number of hurricanes. We know warming and evaporation supports more heavy rain events in wet temperate regions, and warming also supports more frequent and longer droughts in arid regions. In wet regions with heating and more moisture, there is good evidence the number of thunderstorms and severe thunderstorms will be on the increase. You might think there would be a linear relationship, then, with more tornadic thunderstorms. But the evidence and climate modeling show the relationship is not linear. This graphic – with data from Climate Central that was supplied by Harold Brooks, the National Severe Storms Laboratory’s top tornado scholar – summarizes the ongoing and expected changes in tornado climatology. The bottom line indicates there will be fewer days with EF 1 or stronger tornadoes in total, but more days with major (30-plus tornadoes) outbreaks of numerous tornadoes; that is, fewer spotty tornado days and more big event days. I recently sat in on a webinar with Brooks on this topic, and he was quite clear about the lack of clarity in the warming-tornado relationship. What appears to be underway are more favorable conditions more often to make big thunderstorms, but less wind shear to get those thunderstorms spinning (winds shifting in a clockwise direction with increased altitude from the ground up). One year does not make a trend, but 2018 brought the fewest tornado deaths (10) in the U.S. since records began in 1950. And, it was the first year on record with no violent (EF 4 or EF 5) tornadoes in the United States, although there was an EF 4 in Manitoba. 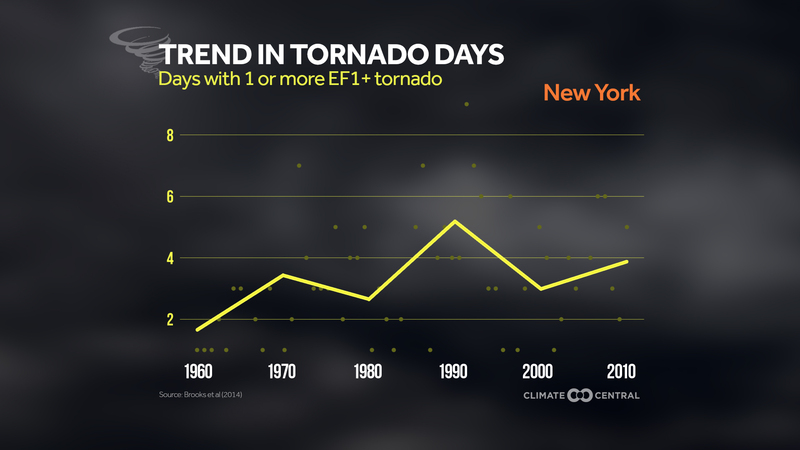 In New York State, at left, there is no clear trend, which would be more difficult to spot due to the infrequency of tornadoes in the state. The next graphic could be a little confusing. Our current decade has last year’s extremely low number of tornadoes nationwide more than counterbalanced by a disastrous 2011, when 553 people were killed by tornadoes. That year, 1,690 tornadoes were confirmed; 48 of the 50 states had tornadoes; and a record 200 tornadoes occurred in one day, on April 27, in the horrendous Gulf states outbreak. In 2011, there were more days with 30-plus tornadoes than the entire period of 1961-1981. Brooks and NSSL staff have examined trends since the 1970s. On the whole, the annual number of days with EF 1+ tornadoes has dropped since the early 1970s from 150 to 100. But the annual number of days with 30-plus tornadoes has increased from less than one to three in the last decade. There also has been more variability from year to year, especially in this decade. 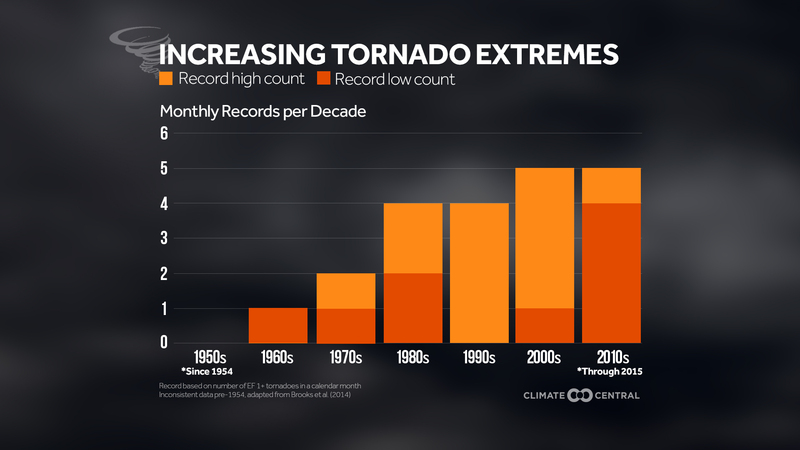 The study shows more monthly record high and low tornado counts have occurred in the most recent 15-year period than in the first 45 years. As for tornado climatology and probabilities during the year, here is animation showing when risks are higher and lower, with data supplied from NOAA’s Climate.gov. As I said, despite our lack of tornado immunity, most of the time we can take comfort in the lower risk here than in nearby Michigan, Ohio and Pennsylvania. On May 31, 1985, six F4 tornadoes and one F5 tornado struck Pennsylvania, including nearby northwest Pennsylvania, killing 75 people in the state. The same outbreak reached Chautauqua County, but with no fatalities thanks to the cool Lake Erie breeze that popped the balloon on what had been an extremely violent tornado in Pennsylvania.